Following the unexpected and tragic death of Robin Williams, we began to not only take stock of the great performances he's offered over the decades, but also those we might still have to look forward to even in his absence. A few weeks back we reported how Williams might be cut from what would have been his last film, Absolutely Anything. Now we've learned he's not even in one that he's already been credited on. "People think that. He's not in it. Robin's not in there." "Let's say Robin's in the movie. Then more people will come!" Below is the image of the on the street ad within The Zero Theorem that had me believing Gilliam's Oscar-nominated Fisher King star had popped by for a small role. But Terry Gilliam says, "No, it isn't." He did mention that in the assembly of actors who popped in to play talking heads in stalking adverts. He had Rupert Friend, Gwendoline Christie, Lily Cole, and long-time cast member Ray Cooper. Perhaps it's the 72-year-old English musician who is actually the Batman The Redeemer spokesperson? 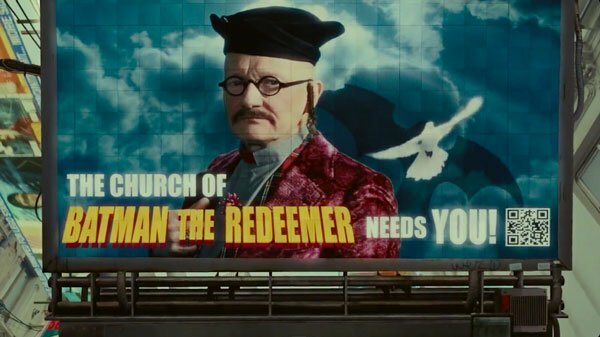 With The Zero Theorem soon to be struck from Robin William's filmography, Absolutely Anything is now Terry Gilliam's last chance to reteam with him. In the sci-fi comedy helmed by fellow Monty Python member Terry Jones, Gilliam will voice an extraterrestrial alongside his former television co-stars. Williams did lend his voice to play a talking dog named Dennis, but his making the final cut was called into question when Absolutely Anything's star Simon Pegg suggested Jones might have needed more time with Robin for the record. Absolutely Anything is due out in the UK next February, so we should know more on that story soon. In the meantime, see The Zero Theorem. Opening in theaters tomorrow, it's great even if it doesn't have a secret Robin Williams cameo.